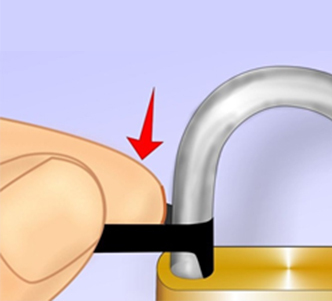 Shimming is defined as violating a lock by inserting a foreign object into the latch mechanism. This is an industry wide issue – nearly all dial type combination hanging padlocks from all lock manufacturers are affected. Since students are storing higher valued/desired items in their lockers such as cell phones, music devices, tablets, computers & more, thieves have more of a reason to try to shim a lock to break in. Master Lock thought of the solution. BlockGuard Anti-Shim technology is a new latch assembly where the latch has a small profile that does not overhang the shackle, so there is no target for the shim tool to hit. The latch also has a flat shape, blocking the shim tool and a grooved top to actually trap the shim tool, which creates a tighter latch-to-shackle engagement when hit. 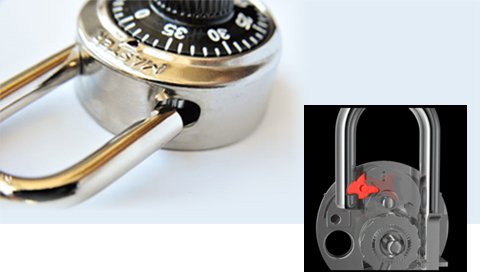 BlockGuard® is available on Master Lock models 1502, 1525, 1572, 1585, 2076, A400 and A400K.